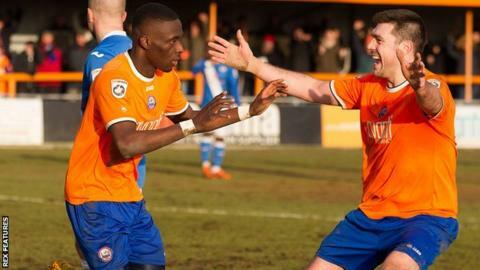 Braintree registered their fifth consecutive victory as they beat Bromley to move up to fourth place in the National League. Lee Minshull's 25-yard strike rose just over the bar and Ben May headed wide as the visitors started strongly. The home side took the lead just before the break as Simeon Akinola tapped home Jack Powell's corner. Bromley came close to equalising through Rob Swaine but his header was deflected wide in the closing minutes. Match ends, Braintree Town 1, Bromley 0. Second Half ends, Braintree Town 1, Bromley 0. Foul by Adam Cunnington (Bromley). Matt Fry (Braintree Town) wins a free kick. Adam Coombes (Bromley) is shown the yellow card for a bad foul. Foul by Adam Coombes (Bromley). Mitch Brundle (Braintree Town) wins a free kick. Foul by Rob Swaine (Bromley). Attempt missed. Rob Swaine (Bromley) header from the centre of the box misses to the right. Assisted by Joe Anderson. Foul by Ali Fuseini (Bromley). Taylor Miles (Braintree Town) wins a free kick. Attempt missed. Joe Anderson (Bromley) right footed shot from outside the box misses to the right. Foul by Taylor Miles (Braintree Town). Ali Fuseini (Bromley) wins a free kick. Substitution, Braintree Town. Taylor Miles replaces Dan Sparkes. Foul by Lee Minshull (Bromley). Substitution, Bromley. Adam Coombes replaces Louis Dennis. Offside, Braintree Town. Harry Cardwell tries a through ball, but Harry Cardwell is caught offside. Mitch Brundle (Braintree Town) is shown the yellow card. Substitution, Braintree Town. Anthony Edgar replaces Simeon Akinola because of an injury. Harry Cardwell (Braintree Town) wins a free kick. Attempt saved. Bradley Goldberg (Bromley) right footed shot from outside the box is saved. Substitution, Bromley. Adam Cunnington replaces Ben May. Attempt missed. Lee Minshull (Bromley) right footed shot from outside the box is too high. Substitution, Bromley. Bradley Goldberg replaces Moses Emmanuel. Mark Phillips (Braintree Town) is shown the yellow card for a bad foul. Foul by Mark Phillips (Braintree Town). Louis Dennis (Bromley) wins a free kick. Offside, Bromley. Ben May tries a through ball, but Ben May is caught offside. Attempt saved. Kenny Davis (Braintree Town) right footed shot from outside the box is saved.